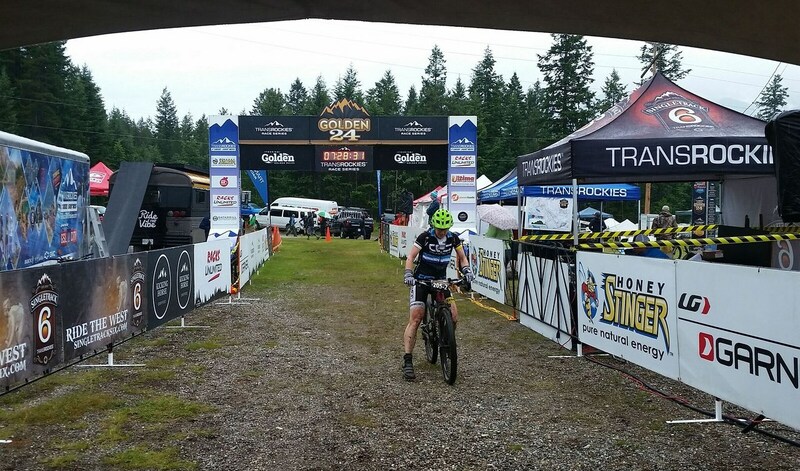 As I edge dangerously closer to doing a 24hr MTB race solo, I found myself doing the inaugural Golden24 (in Golden) (yeah) as a mixed pair with Felix. 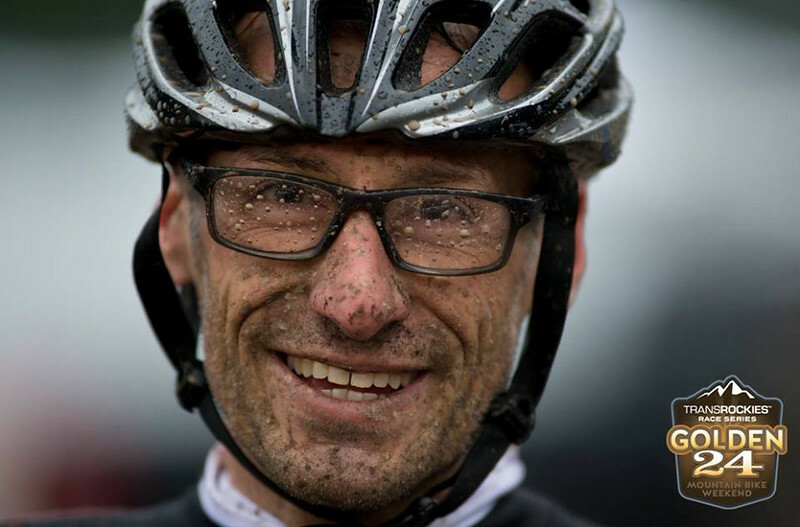 It was a plan laid back in winter 2015, when the very idea of the challenge of riding as a pair sounded fascinating. As it got closer, it started to sound less fascinating, more alarming. But we had been riding our bikes up a lot of hills, and were feeling pretty good. It was only the first year for the race, so the field wasn’t huge. And there were a lot of categories to choose from, including a cruisy 8 hour option for the race, rather than the 24 hour. So we ended up with just one other mixed pair to race against. There were no female pairs, but five male pairs. So we quietly decided we’d try and beat those too. The weather forecast wasn’t great, right off the bat. We were expecting rain. A lot of rain. 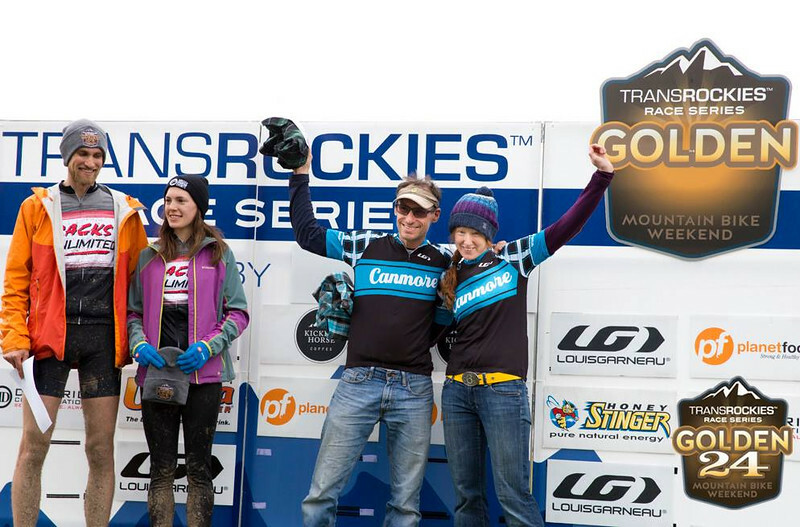 But the race was run by the Transrockies crew, who do a great job of running a well organised and fun race, even if the weather isn’t cooperating. Felix did a double lap up first, and I did the same. It was on my second set of double laps that the rain kicked in properly. From then on, the course just got greasier and greasier. The hills were covered with people trudging beside their bikes. Alex came by with pizza, making us the envy of many surrounding teams. But then it was 11pm or so, and I was due to head out for a triple night lap. The rain got heavy. The course was quiet. You could go a few kilometres without seeing anyone. I churned away through the mud. It was all fine at first, I had waterproof mitts on, I eventually put on my waterproof jacket – but by then it was too late, I’d gotten soaked through. 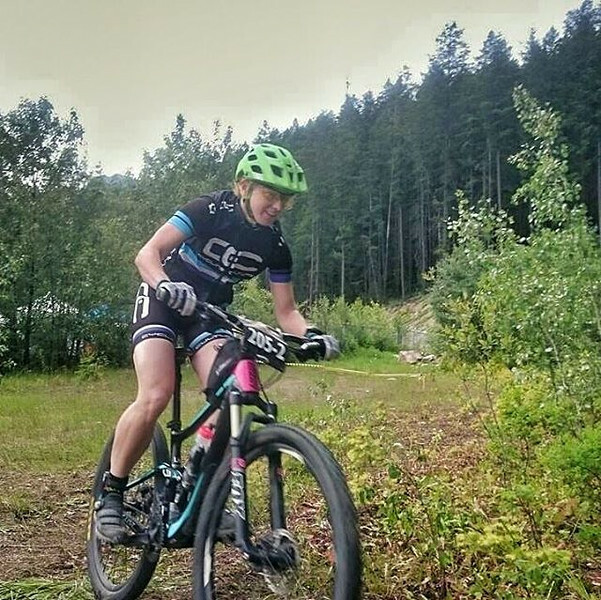 The descents were cold, and I struggled to push and keep myself warm. I sang a lot, riding through the muddy, misty forest. The mud was in my drive train, making my gears unreliable. I stopped after the first two of my triple laps, hosed off my chain, switched my headlamp out to a fresh one, and kept going. 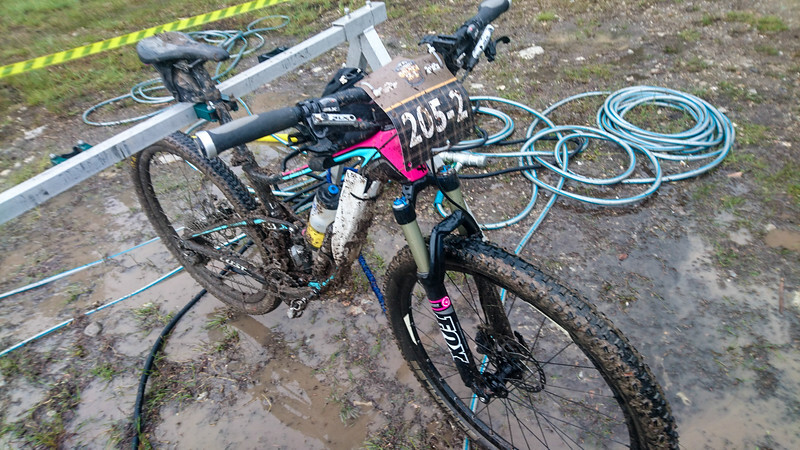 Course was muddy, legs were tired, I was tired – despite the chocolate coated coffee beans I’d been munching on. I was feeling guilty about the damage we were doing to the trails. They looked terrible! The fun swoopy descent was now nothing but cold muddy porridge. I slowed down, and made futile attempts to minimise the damage I was doing. The final climb up into camp was terrible now. It lasted so much longer than it felt like it should have done, and threw some of the worst of the mud at us. But then, finally, I was done my three night laps. I sent Felix out – he had been lying in his tent hoping I’d call it quits. Apparently I’m more stubborn than that – and didn’t want to let him down. I went and washed my bike off, tried to eat, then curled up in my tent. Still cold. I hopped up, retrieved a blanket from our waiting-room tent, and tried again. Gradually the shivering subsided and I slept a little. Then, morning. My last lap was the hardest. The course was nothing but mud, and my legs had nothing more to give. I tried to go fast, and felt like I was doing ok, but in fact I only had one speed, which was not terribly fast. I sent Felix out for one last lap, then that’s that, we were done. 18 laps, we’d beaten the closest men’s pair (16 laps) and came in at fifth overall, beaten only by some men’s 5-person teams and a 4-person team. Victory! Victory apparently came with some sweet flannel shirts. Followed by a huge lunch, and falling fast asleep for the entire drive back to Canmore (including the parts where my family stopped to check out the Spiral Tunnels, the Natural Bridge, and Emerald Lake). 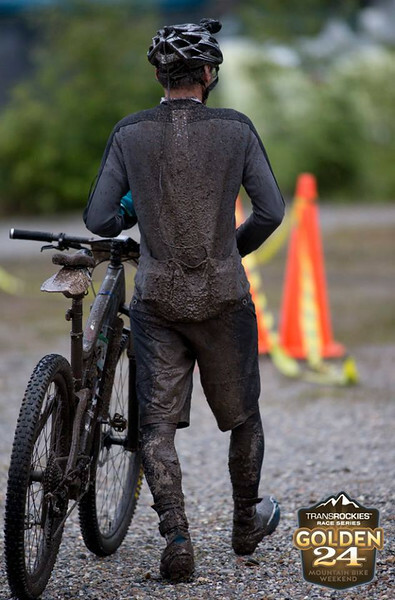 Maybe I could do a solo 24hr, but I’d really rather not do one in the mud. Thanks Vik! 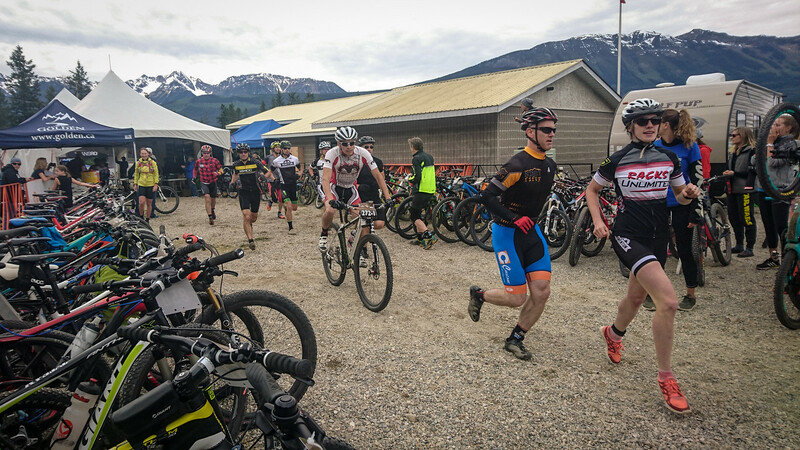 I’m thinking I’ve had my fill of racing in the rain – between this, the 24 Hours in Canmore, and the Granfondo… it’s just so hard on your bike too. Hey can I ask what camera your are using for your blog photos? I need a new camera and figured I’d get some suggestions. I have an 8yr old “winter” bike for the wet season here on the island. That way I don’t feel bad thrashing it, but I still don’t enjoy riding in the rain for extended periods of time. I mostly use my EOS 7D. But also some are just phone photos (with a Samsung Galaxy 4, and then a Sony – which I have now broken so I’m back to the Samsung). I’ve been dreaming of one of the nice mirrorless cameras that a few people seem to have these days though – for those trips when it would really be nice to have good quality images without lugging along the full dSLR and lenses. I would like one of those cameras as well. My DSLR is great, but I rarely want to haul it on trips as my gear shrinks and my ambitions grow. My buddy Doug [who you know I think] has recommended the T1 or T2 from Fuji. I would love an even smaller camera, but on the PNWet we spend so much time in the deep forest I need a camera that can take a reasonable low light shot with some movement in it. The key will be finding a way to carry the camera on my pack harness or belt that’s fast access and not annoying. If I have to take off the pack to get the camera I might as well not bother bringing it. If a fairy godmother came along, I’d be inclined to ask for a Fuji XT-2 or XPro-2 I think – but some of the Panasonics look pretty tempting too. For now I’ll keep getting by with what I have, but I hear you on the shrinking gear, I’m in a similar place – especially out riding, lugging along the dSLR is a pain. Also I’d seen this attachment: https://hikinginfinland.com/2014/01/peak-design-capture-pro-camera-clip.html for clipping your camera on your pack – I don’t know if I’d be happy with my camera out and exposed though, I think I’d be more inclined to find a way to attach a bag to my harness/belt. I’ve seen camera clips like that. Even with weatherproof-ish and dustproof cameras I don’t think I could ride with one attached like that! I think a hip mounted bag with a quick access lid would be ideal.